Happy Monday all y'all! Today's tip is short and sweet and something I have just done this weekend, had near instant results in my heart and spirit, and seen a positive response in my children already. I want to share, just in case you are in a similar season. I'm not going to back up in this story much because it's not the point, but in our school here at Akin Academy, we not only hit a rut, but were spinning out in that rut. There was not much enjoyable about our days as I drug my kids through their daily work. And let's face it, even when you homeschool, no matter how much hands on or free time you try to incorporate, sometimes it's still just work, and it has to get done. Much of education is repetition in some form or fashion, especially in the earlier years. So, it had become like...no, worse than...pulling teeth to get anything done and instead of being efficient and enjoying much of our day together, I had one to two kids still sitting at a table refusing to get done at dinner time each night. I felt like I was banging my head against a wall and think they were pretty much feeling the same way too. So here's what I did, on the suggestion of a friend, and what I'm suggesting you do if you are in a similar rut.... Seek a mentor. Not someone who is in the same place as you currently are, but someone who has successfully come out the other end of where you are. It's nice to talk to friends who feel me with the day to day, but when you are truly struggling to get out of that rut and set on a right path (homeschool or not)...whether it's undoing bad habits, getting your heart or priorities in check, or seeking 'permission' to let go of some of your well-intentioned expectations....finding someone who can do more than feel you has extreme benefits. I reached out to a friend who has done her time as a homeschool mom of four, with her youngest two in their high school years. She was so wonderful to meet with me the next day over lunch and share her heart as she listened to my ranting and rambling about all that I thought I was doing wrong, how my kids won't comply and my irritation with it all. She just smiled, nodded in sincere understanding, and shared valuable wisdom and experience of how God brought her through those years. Shedding light on things that worked for her, suggestions of things to try, and the realization that I am not bound by a program in the education of my children, nor are my lofty expectations of them (or myself) fair to anyone. It was a glorious time of sharing, even if some of it I already knew, somehow the speaking it out loud with a seasoned homeschool mom, sweet friend and sister who was able to shed light on God's truth in the process, was the resetting I needed. 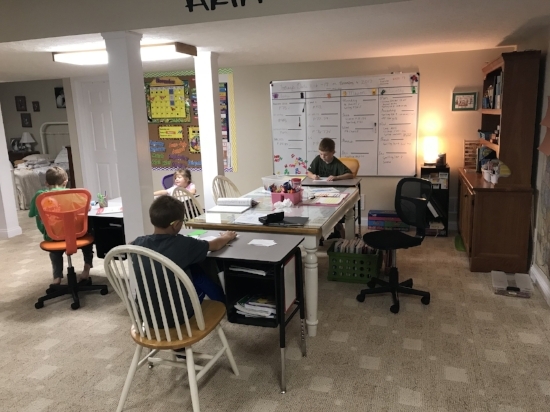 The permission, perhaps, I was seeking from someone who had been there, to let go of this idea of a perfect homeschool where I am the authority, and just show up every day in my imperfection, to our imperfect homeschool and let God be the authority. Bless her. She was wise in her words and her compassion. Seek a mentor friends. It is life giving to know you are not alone and that there is a reason you're spinning your wheels, and a fresh perspective and a little grace might be all you need to get set back on the right foot.